MAN: Everybody real quick. I’m sure you guys all know when you pull out your weeds pull out the roots, as much roots as you can. 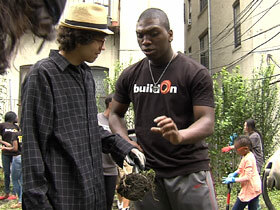 BOB FAW, correspondent: In a poor south Bronx neighborhood, high school sophomore Rhani Davis and senior Eddie Bonner, volunteers in a group called buildOn, are doing more than turning a vacant lot into a community vegetable garden. RHANI DAVIS: I think that’s one of buildOn’s mission statements: We see a problem, we feel like we need to fix it, and that’s when we come in. EDDIE BONNER: (talking to volunteer) Shake the dirt off. Leave the dirt inside. We basically transformed a weeded out, destroyed area. We can actually say that we did something to benefit the neighborhood. WOMAN: Once the gentleman got finished with the handshake for the stadium, we need someone tall to write on it. FAW: And at this south Bronx high school, buildOn volunteers like Mohammed “Mo” Tunkara are transforming a drab wall into a colorful mural. A few years ago, “Mo” wouldn’t have been caught dead doing this. MOHAMMED TUNKARA: I was thinking about being cool and trying to define being cool. FAW: Now, because of buildOn, “being cool” has an entirely different meaning. TUNKARA: Two, three years ago, I was lost. I was lost in my own life. I mean I had family problems at home. 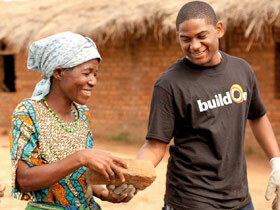 So when I first started to like join buildOn and actually be a part of it, it was a life-changing event for me. It was the, like it was the biggest turning point in my whole life. Now I want, I want to change the world now. FAW: That audacious goal of “changing the world” is the mantra of buildOn’s founder, 47 year old Jim Ziolkowski, who stepped out of the fast lane in corporate finance to achieve something more than making money. 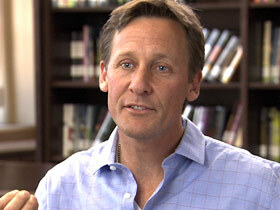 JIM ZIOLKOWSKI (Founder, buildOn): I believe strongly in the social justice aspect of my Catholic tradition. But I wasn’t living it, and I wanted to reconcile my faith with the way I was living, so I started up buildOn. Our mission is to break the cycle of poverty, illiteracy and low expectations through service and education. And the way we approach it is by organizing afterschool programs in very challenged communities, urban environments and urban high schools across the United States. MAN: For now if we can get all the vegetables that are in the borders to kind of look like this, that would be great. You guys are all doing an excellent job. Keep it up. Thank you. FAW: The students plant gardens, work with the elderly, the sick and the homeless and many of them travel to such far flung spots as Malawi, Nepal and Haiti to help build schools. Funded by private foundations and contributions buildOn has constructed 546 schools abroad with the help of the local communities and with American volunteers, some of whom many people have written off. ZIOLKOWSKI: There are no bad kids. I think every kid, no matter what the circumstance, can elevate, can rise above. And I am convinced that the kids from the most challenging circumstances are also the grittiest, the most determined and have the biggest capacity for compassion. FAW: Some of these kids have had difficult lives. Eddie Bonner was hanging out on the mean streets of the Bronx when a friend was murdered. BONNER: It was just basically a traumatic experience because me and my friends were actually just hanging out together and he basically was murdered in front of our face. FAW: Since then Eddie has helped build a school in Nepal, has helped clean up neighborhoods at home; and all that has helped change who Eddie Bonner is. BONNER: If it wasn’t for buildOn, I tell you I wouldn’t be doing nothing else. After I did it once and I felt like somebody actually needed me for something, I started going back. And it actually keeps you so busy you don’t have time to think about the negative, you always focus on the positive. WOMAN: Dip it in and then paint. FAW: Likewise for Gimy Arzu. At 14, he joined a street gang. Now he’s joined buildOn. GIMY ARZU: BuildOn changed me as a better person and a better man. ARZU: What way? I’ve been working hard in school. I’m on my way to college. FAW: Jim Ziolkowski who says buildOn, which closely monitors what each student volunteer does, has seen radical changes in their academic achievement too. ZIOLKOWSKI: What we’ve seen, even in schools where four year graduation rates are 50 percent or less, 94% of our kids are not only graduating, they’re going to college. MADELINE RIOS (The Bronx Center for Science and Math): (speaking in hallway) Come back afterwards. It's from eleven 'til one, right? FAW: From her vantage point as assistant principal at the Bronx Center for Science and Math, Madeline Rios has witnessed those changes. RIOS: I’ve seen a big confidence booster in their personality, in their schoolwork. I think it’s important for people to have a purpose and the kids like that sense of wow, I did something for someone else. FAW: And buildOn isn’t just trying to change kids like Mo or Gimy. It is also quite literally trying to change the world by building hundreds of those schools abroad. It’s a mission he’s undertaken because of a devout Catholic faith which his father helped instill. And which Jim Ziolkowski says he sometimes reinforces with a passage from Mark about confronting his fear of failing. ZIOLKOWSKI: I go back to that passage about fear all the time. For me, my trust in God, I was able to overcome that fear. And then you got to get by it so that you can step up and do what you know you’re capable of doing. FAW: Even though pancreatic cancer claimed his beloved father, and his older son was ravaged by encephalitis and meningitis, Jim Ziolkowski’s faith has not wavered. ZIOLKOWSKI: This journey with my son Jack has reinforced and strengthened my faith. I rely on it more than I ever have, and I’m thankful. I know that’s a gift. I’m thankful. 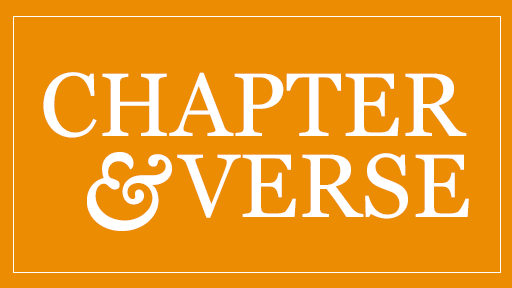 FAW: He has described all the heartache, and all the success of buildOn, in his forthcoming book, whose subtitle poses the daunting question: can one person change the world? ZIOLKOWSKI: I’m convinced that we can, and when we do it collectively, it’s gonna become a massive movement. You gotta decide what you’re passionate about, I think you’ve got to take that first step, in service, and then light that fire and that ignition is something that nobody, nobody can put out, that fire that you start, no one can extinguish. FAW: The way Eddie and Rahni in the garden, or Mo with that paint brush are doing, one project, one day at a time. DAVIS: From nothing to something, which is kind of what buildOn is truly about. Going from nothing to something. FAW: Five hundred plus schools, one million plus hours — and counting. GROUP: We are buildOn! We are buildOn! FAW: For Religion and Ethics NewsWeekly, this is Bob Faw in the south Bronx. “I am convinced that the kids from the most challenging circumstances are also the grittiest, the most determined. and have the biggest capacity for compassion,” says buildOn’s founder Jim Ziolkowski, who started the volunteer service organization to fulfill the social justice aspect of his Catholic faith.